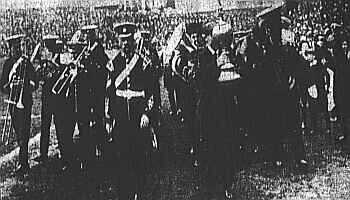 I know that our highest ever attendance was 54,775 in the FA Cup in season 1923/24 but what is our highest attendance for a league match? The highest confirmed attendance that I can find for a league match at Turf Moor is 49,815 for a match played against Blackpool on Boxing Day 1949. There is a match against Tottenham from April 1924 where the Turf Moor crowd was put at 50,000 but as that was an estimate and is completely at odds with our other home attendances in the league around that time I doubt that is a true figure. There have been several FA Cup matches over the years where the crowd has topped 50,000. 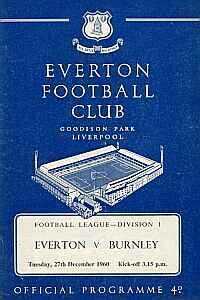 The highest ever crowd to watch Burnley in a league match was the 74,867 at Goodison Park Everton on 27/12/60. Of course Burnley were the reigning Champions and Everton were also going well that year but it is still a remarkable figure. I have in fact seen a report of the game that put the crowd at 75,667 but whatever the real figure was it is by far the largest. The size of the crowd might also have had something to do with the fact that in our previous two away fixtures we had come back from 4-0 down to draw 4-4 at Tottenham and also beaten Arsenal 5-2 at Highbury. For the record we kept up the good run by beating Everton 3-0. When did Burnley fans first start singing ‘No Nay Never’ and was there a time when it was aimed at Manchester United? We believe that the song was first sung in the early 1970’s with the words ‘Will we play Blackburn Rovers, no never no more’ and I’m not just being polite, those were the words actually sung. In the late 1970’s the words had changed to ‘Till we play…’ but the words of the original had a clear meaning, Rovers were relegated in season 1965/66 dropping in to the old 3rd Division by 1970/71 and we wondered if we would ever play them again. Some of the first lyrics remembered included the line ‘I saw Kenny Furphy his money all spent’. Furphy had taken over as the Rovers manager at the start of the 1971/72 season and remained for 3 seasons so if that was the first version then it would indicate that it was sung during this period whilst they languished in Division 3. No one that I’ve spoken to recalls the song being sung about Man Utd and, of course, as the song was a reworking of ‘The Wild Rover’ the ‘Rovers’ link was sadly missing but Man Utd were themselves relegated in season 1973/74 so I suppose it is possible that the same original meaning of the song was also applied to them. When was the last time that 2 Burnley players scored a hat trick in the same match? Amazing as it sounds between 1983 and 1985 we scored 7 goals or more in 4 different matches despite suffering 2 relegations and a mid table finish. The first of these was on 5/2/83 in the old Division 2 when Billy Hamilton and Steve Taylor both scored 3 in the 7-1 win over Charlton at Turf Moor, Trevor Steven scored the other goal. The following season on 26/11/83 just Kevin Reeves scored a hat trick in the 7-0 home win over Port Vale with the other goals coming from Willie Donachie, Brian Flynn, Tommy Hutchinson and Billy Hamilton. Kevin Hird kept the tradition going in a match against Rotherham United on 2/2/85 that also finished 7-0 with Wayne Biggins notching just the 2 and other goals from Peter Devine and Les Lawrence. In answer to your question the last time 2 different players scored a hat trick in the same game was on 1/11/84 when Kevin Hird and Alan Taylor both knocked in 3 apiece with Barry Powell scoring 2 and Neil Grewcock 1 in the FA Cup first round tie away to Penrith which was won 9-0. Barry Powell is a player that is little remembered and the 2 goals he scored that day were his only goals for the Clarets but if had managed to get another goal he would have really written himself into legend. The feat of 2 players scoring hat tricks in the same game is fairly rare and has only ever happened in the following other seasons: 1891/92, 1903/04 (FA Cup), 1951/52, 1956/57 (FA Cup), and 1957/58 with Jimmy McIlroy scoring 3 on both of the last 2 occasions. How many teams have come close to our unbeaten run of 30 matches in a season? There are 2 other teams that have got to 29 in a single season. Leeds in 1973/74 who looked odds on to equal the record as they were on 29 and led 2-0 away at Stoke before eventually losing 3-2. Liverpool in 1987/88 who lost 1-0 away to Everton in a match that I seem to remember was televised. Both Liverpool and Leeds runs went from the start of the season whilst ours started after 3 straight defeats but one thing all 3 teams have proved is that if you go on such a good run you will be parading the Championship trophy around your ground come the end of the season. Did Ian Moore and Andy Cooke play in the same Burnley side? Ian Moore signed for Burnley on 20/11/2000 and Andy Cooke departed for Stoke on 1/12/2000. In between those two dates the Clarets played only one match and that was the 2-0 victory over Norwich City at Turf Moor courtesy of goals from Andy Payton and Steve Davis. Ian Moore started the match on the bench but got an early chance to show us what he could do when he replaced an injured Lee Briscoe after half an hour. Graham Branch had started the game up front with Andy Payton but he filled Briscoe’s left back position allowing Ian Moore to join the attack. Andy Cooke was still available for selection but was not even named as a substitute. The Clarets should have been in action the following Saturday when both Moore and Cooke were still in the squad but the match at Watford was postponed shortly before kick off due to a waterlogged pitch and before the next match Andy Cooke had been sold for £300,000. I know about the Bee Hole End how did it come to be known as that please? The land between Turf Moor and the bottom of Brunshaw hill was known as Bee Hole for at least 300 years. As far as I’ve been able to check it was just an informal local nickname for the area. I think it would have probably faded out of use in the 20th century were it not for the fact that in 1878 coal deposits were discovered and Bee Hole Colliery was opened. It would have been known simply as Bee Hole in the same way that other mines in the area were known just as Bank Hall or Hapton Valley for instance. Only 5 years later the embryonic Burnley FC moved onto the adjacent land at Turf Moor and some basic local geography was applied to the two areas behind either goal and we had the Cricket Field End and the Bee Hole End. The colliery actually stood very close to Turf Moor as you can tell from the fact that the lane which still runs just behind the ground used to lead to the pit head. Bee Hole was closed down in 1921 when it ceased to be economical but it had been there plenty long enough for the name to stick and I believe the gates to the colliery were still present in the 1960’s. Of course the Jimmy McIlroy Stand has now replaced it but I suspect the name of the Bee Hole End will live on for a good few years yet. What is the title of the spooky music played before the team runs on? I know it is from The Omen but what is it really called? The music is 'O Fortuna' from Carmina Burana, a cantata composed by Carl Orff, a 20th Century German composer. It comes as a surprise to many that it is NOT the music from 'The Omen'. Admittedly they do sound similar but that music was composed specifically for the film and is called 'Ave Satani'. 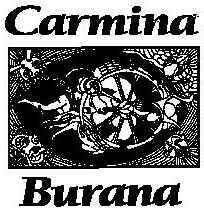 Getting back to '0 Fortuna' and Carmina Burana it was first performed at the Frankfurt Opera on the 8th of June 1937. It is sung in Latin and the opening words are 'O Fortuna, velut luna, statu variabilis, semper crescis, aut decrescis' which are actually quite apt for supporting Burnley as they translate as 'O fortune, you are like the moon, ever waxing and waning'. I can't see it catching on but at least you can sing along to the first few lines in Latin now. Can you tell me what has happened to each and every one of the playing and coaching staff from the 1991/92 4th Division Championship season? Jimmy Mullen – Involved with coaching the Welsh under 17’s alongside Neville Southall. Update We have also been told that Jimmy is managing Little Drayton Rangers in the West Midland Premier League and also managing Shropshire under 18's. Andy Marriott – Playing regularly for Barnsley in Division 2. Chris Pearce – Works in Blackburn and still coaches locally. Nicky Walker – Reserve keeper for Inverness Caledonian Thistle in Scottish Division 1. Ian Measham – Working for a car dealership in Cambridgeshire. John Pender – Was playing for Rochdale until 1999. Mark Monington – Playing for Boston United in Division 3. Steve Davis – Alive and well and playing for Burnley. Paul France – Played for Altrincham for many years. Update Working with the Community Programme at Huddersfield Town. Jason Hardy – Last heard of playing for Hyde United in the Unibond League. Mark Yates – Playing for Cheltenham Town in Division 2. Andy Farrell – Working with the Community Programme at Turf Moor. John Deary – As far as I know he still runs his Astraglaze double glazing business in Southport. Adrian Randall – Living in the South and was still playing non-league football until fairly recently. Robbie Painter – Currently playing for Bradford Park Avenue in the Unibond Premier Division. Graham Lancashire – With Hednesford Town in the Dr. Martens Premier League. Mike Conroy – Coaching in Australia. John Francis – Coaching with the Leeds youth team. Roger Eli – Living in his home town of Bradford where he combines running a textiles business with managing a local football team. Joe Jakub – Update We are told that he is working for the Press Association providing live match reports. Steve Harper – Playing for Darlington in Division 3. Danny Sonner – Playing for Walsall in Division 2. David Hamilton - Update Chief Scout for Wigan Athletic and also involved with Blackburn Northern cricket club but still a Claret.